REYNOLDSVILLE – Last month Jeff Tech in Reynoldsville celebrated National Career and Technical Education month with a variety of activities. The first activity included door decorating. The staff members were asked to decorate the doors to their classrooms and offices to showcase their previous schooling and jobs as well as their interests. In viewing the decorated doors, students were able to see why education, work and positive leisure activities are important for success. Next, one of Jeff Tech’s display cases was used to illustrate and recognize Jeff Tech students who participated in Skills USA, a Career and Technical Skills Competition. School staff also hung banners as a reminder that it was Career and Technical Education month. Students were also encouraged to “Dress for Success” on Friday after a Spirit Week was held where students were asked to participate in any number of activities to promote CTE education. Lastly, students attended a Career Fair comprised of more than 70 participating schools and businesses from the community. 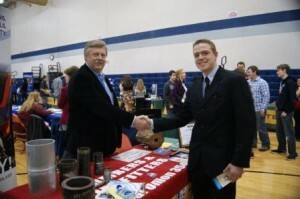 The school’s talents were on display at the Career Fair as students had samples of their work. The Career Fair would not have been such a success if it had not been for the support of Jeff Tech’s Occupational Advisory Committee members, local businesses and the community at large. Are Sports Drinks Better than Water for Athletes?